Are you old enough to enjoy? This is part of our commitment to the responsible drinking of our consumers. I have reached the legal drinking age. DO NOT CHECK THE ABOVE BOX WHEN YOU ARE USING A SHARED DEVICE. JIANGJI encourages responsible drinking. Alcohol abuse is harmful for your health. We won't share your info with third parties. This Tuesday, February 26, 2019, a very special party took place in Chongqing, China. Having been on the international market for over 2 years, Jiangxiaobai finally followed demand and after necessary research period released its first product specifically dedicated to a global audience. 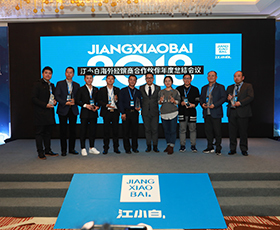 When asked what he expected from the new product, Matthias Xu, from Jiangxiaobai’s distribution partner in Germany, replied, it would be much easier to share the brand’s attitude and spirit with a foreign audience. Just like done so on the domestic market before, Jiangxiaobai is now aiming to help spread better understanding for a young generation. 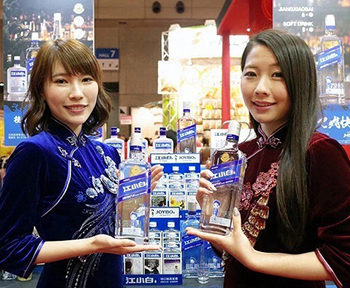 Lending their voice to the youth of China, the hip baijiu brand not only supports and builds Chinese youth culture, but also sheds light on an area widely unknown to the rest of the world. What moves the upcoming generation of one of the largest economies in the world? By launching product series PURE, Jiangxiaobai acknowledges the changes of the era, saluting the youth and the world. At the launch event ‘PURE PARTY’ at its very own party venue, Jiangxiaobai played fireworks of light and sound. The venue entrance was stylized with colorful neon typeface, glowing product sculptures and electric blue decoration elements. Visitors from all around the globe were served small snacks and refreshments, as well as inhouse-made drinks. The bar menu included classic cocktails, specialty drinks, new mixes and more. Showcasing PURE’s best features, the selection of drinks contained exotic Jiang Mix creations with almond aroma, lychee and osmanthus blossoms. For a more simple pleasure event attendants could get PURE mixed with ginger ale or just go bold with a row of shots. The smooth flavor qualities of the sorghum spirit even drew praise from the distributors for the Japanese market, claiming that the pure taste might break Japanese perception of Chinese product quality. After an initial period of meet-and-greet as well as casually hanging out it was time for the evening’s main show. International department director Zoe Fu went up on stage and led the audience through an audiovisual spectacle. If the evening’s eclectic dance performance following the opening display can be any indication for the brand’s energetic, youth-oriented spirit, future events promise full excitement. In its product design, PURE takes the modern simplicity of urban aesthetics and combines it with the strong symbolic value of the Yangtze River, the natural force endowing Jiangxiaobai production site Baisha town with its optimal conditions. The tall clear glass bottle of rectangular shape features the graphic design of a wave of 3 strokes on the front side, channeling the spirit of the Yangtze. UK distributor Vincent Liu liked the more international bottle shape, saying that it would make a great choice for any bar. potlights the PURE series’ pride was unveiled, the P750 bottle. In its product design, PURE takes the modern simplicity of urban aesthetics and combines it with the strong symbolic value of the Yangtze River, the natural force endowing Jiangxiaobai production site Baisha town with its optimal conditions. The tall clear glass bottle of rectangular shape features the graphic design of a wave of 3 strokes on the front side, channeling the spirit of the Yangtze. UK distributor Vincent Liu liked the more international bottle shape, saying that it would make a great choice for any bar. The screening of the brand video showcased the young and inquisitive spirit once more. Drone shots on the Tibetan plateau and young people in mountain-climbing gear gathering around a bonfire, sharing a drink with local guides. The clear and pure streams of winter mountains, a shiny bottle reflecting the surrounding snows. The sense of adventure and exploration was imminent, a feeling that the PURE series wants to kindle and nourish, catering to the curiosity of our times. Towards the end of the party, company founder and CEO Tao Shiquan went on stage for a surprise speech. There, he addressed the ambitious intentions for PURE. 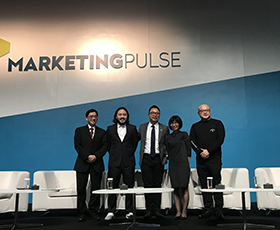 ‘We want PURE to spearpoint our overseas success’, he exclaimed, setting a clear objective for the present overseas distributors. The tribute to both the international community and Chinese heritage was complete. CHONGQING JIANGJI DISTILLERY CO., LTD.
A Company subject to the management and coordination activities of CHONGQING JIANGXIAOBAI LIQUOR CO., LTD. All rights reserved.